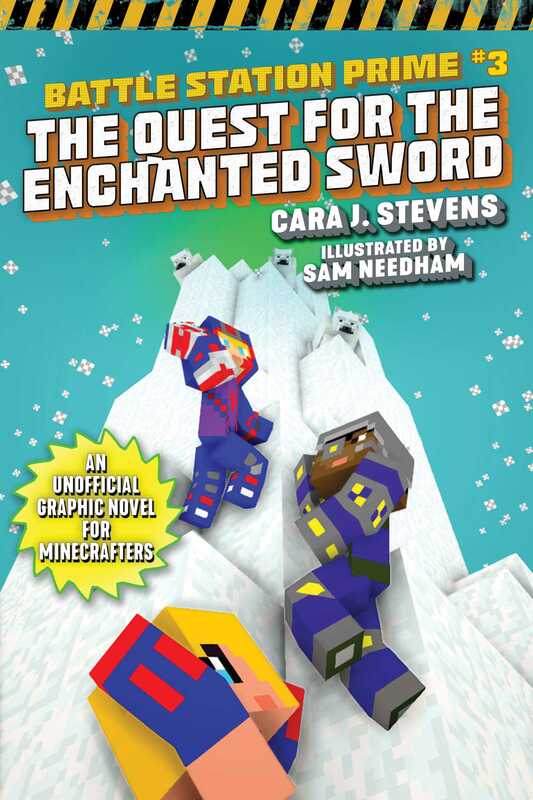 Continue the adventure in the third volume of Battle Station Prime, an edgy graphic novel series for Minecraft fans. After defeating the skeleton army invasion, things get awfully quiet at Battle Station Prime. School is in session, and the students are finally falling into a routine. One ordinary day, while Pell is daydreaming about a life of adventure, his ears perk up. His teacher speaks of a magical realm with an enchanted sword that only a true hero — the Chosen One — can possess. After reading more about the legend, clues in the text make Pell think that he may be the Chosen One and this is his calling. Pell enlists the help of Logan and Maddy to embark on a hero’s quest. To their surprise, as they set out, they are joined by others who believe that the hero’s quest is theirs. At first, the opposing groups compete to see who can find the magical realm and get to the sword first, but as the going gets tough, the teams must work together to cross the challenging frozen landscape, battling natural enemies and using their survival skills. As the groups get closer to their goal, they uncover secrets long hidden about the true nature of one of their fellow travelers: that the Chosen One has been traveling with them all along, and it’s someone they never suspected. Cara J. Stevens has a deep and abiding love for video games, science fiction and writing. She began her career designing interactive games and stories based on books and is happy to come full circle, creating stories based on video games. She has written nine other books for kids, including the novel Dragon School. When she’s not writing or hanging out at the beach, she can be found playing pinball, WiiU, and classic Atari games. Cara lives in Old Greenwich, Connecticut with her husband, two children, and a loud, fluffy dog named Oliver.